So happy to see so many pelicans again, mature as well as immatures. 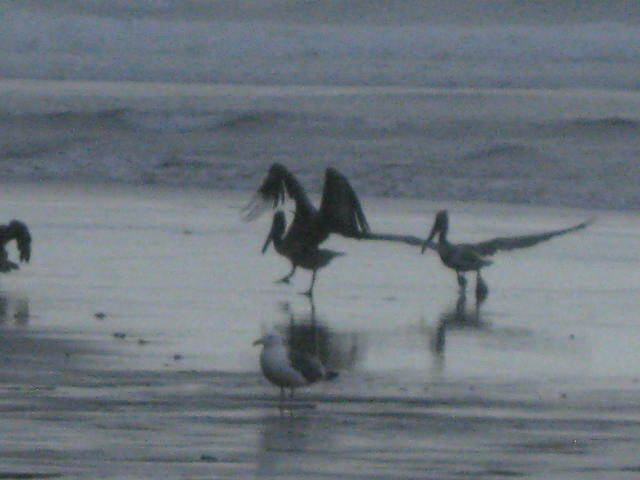 Many pelicans again, mature as well as immatures. 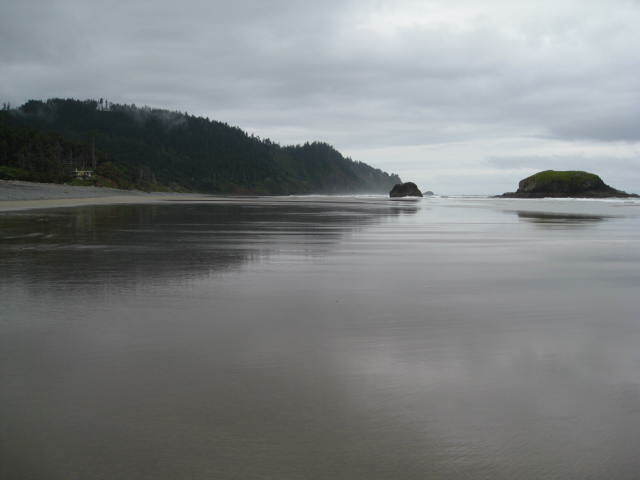 I was the only person on the shoreline. There was one bald eagle circling above. 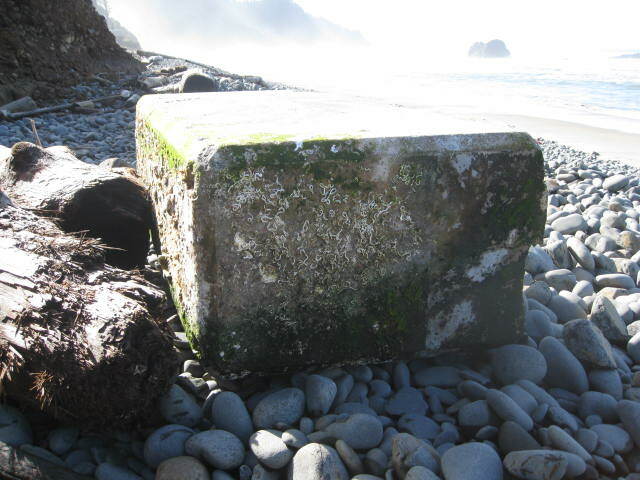 There were no man-made or natural changes to the shoreline. 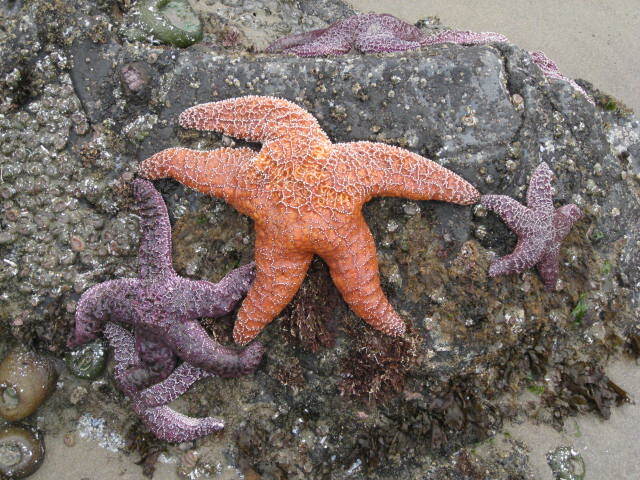 A very nice day at Cove Beach. Sixteen people were enjoying the nice weather. There is nothing unusual to report. 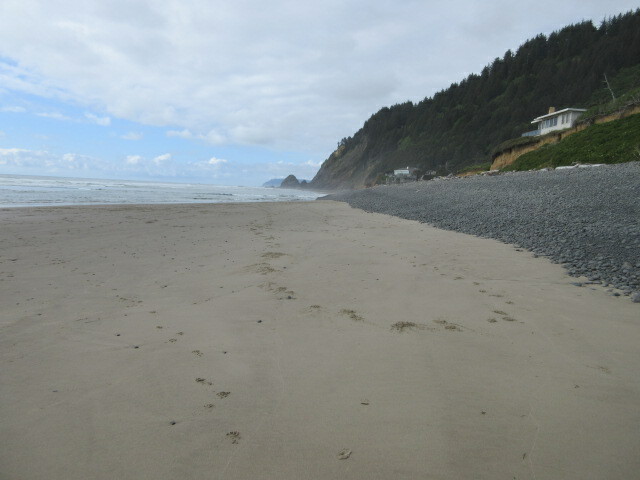 The beach was very clean. 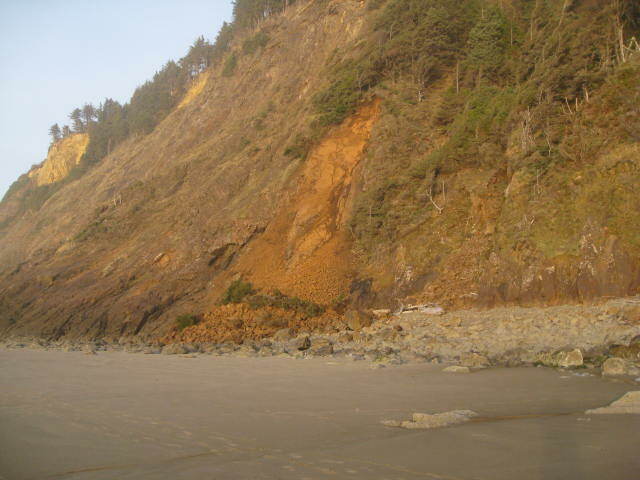 Heavy rains have caused serious slippage of the bluff. Waves hitting the bluff. 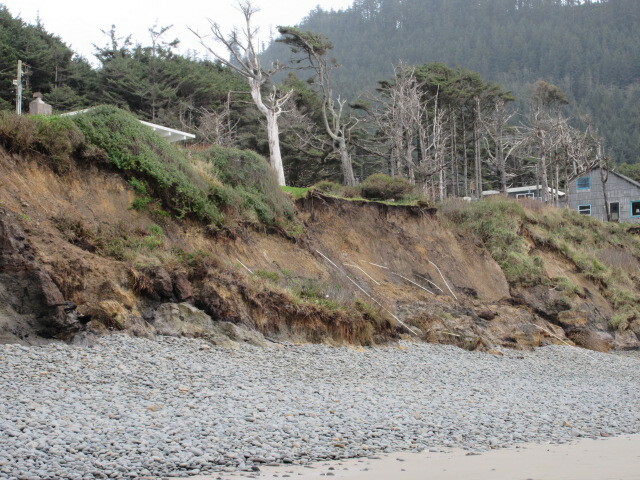 No beach access anymore due to slides in the central area of Cove Beach. 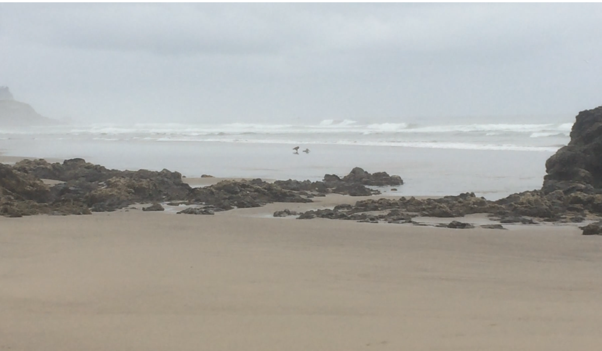 Thirteen people and their dogs were enjoying the beach. 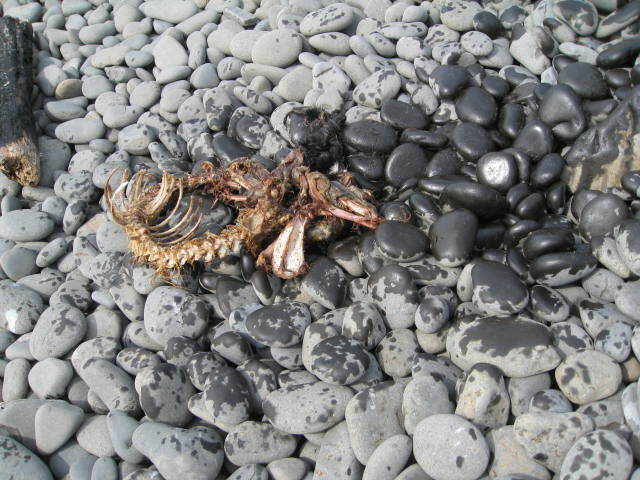 Their were two dead murres on the beach.There were no sea stars at Arch Cape.The was nothing unusual to see on the beach. 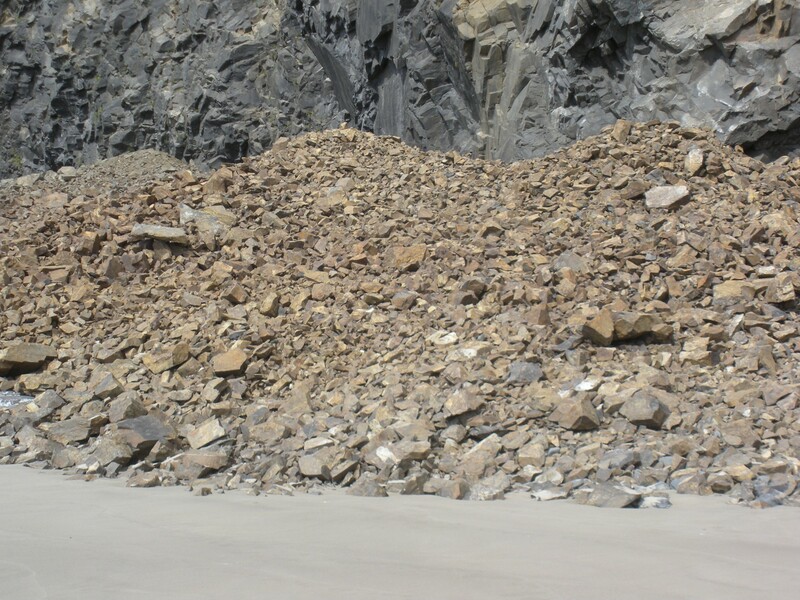 Much new sand (more than we have seen in years! 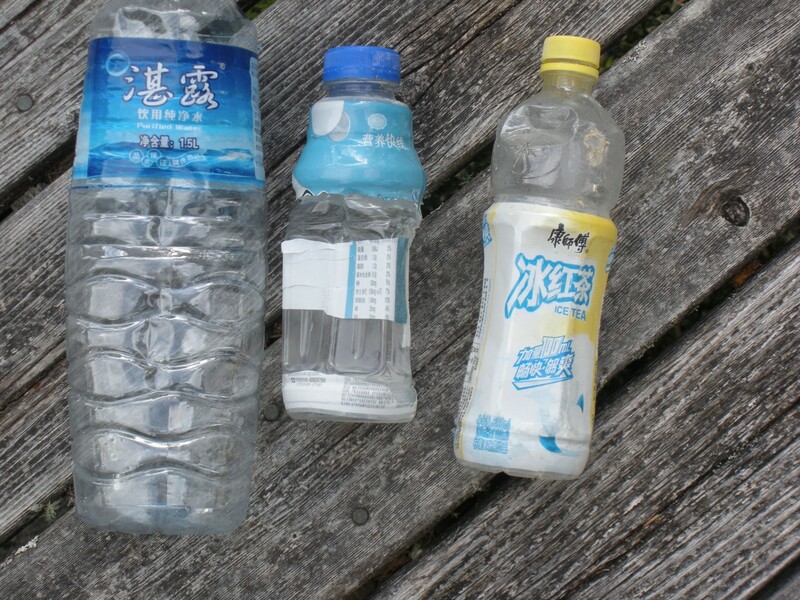 )Lots of drift wood, large and small.A fishing float, and several Japanese drink bottles. 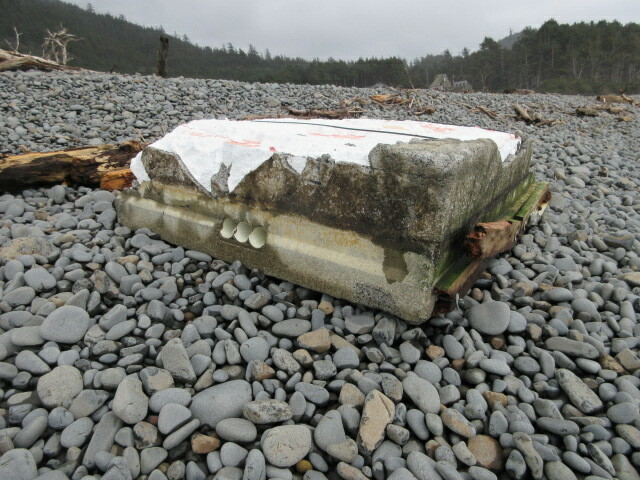 Perhaps Tsunami related? 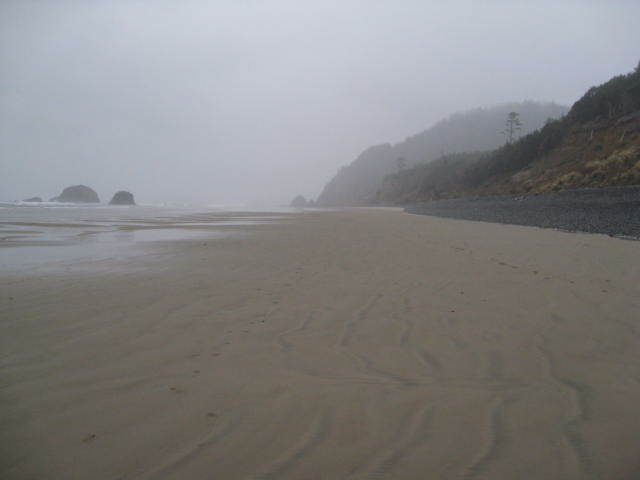 It was a very windy and rainy day. 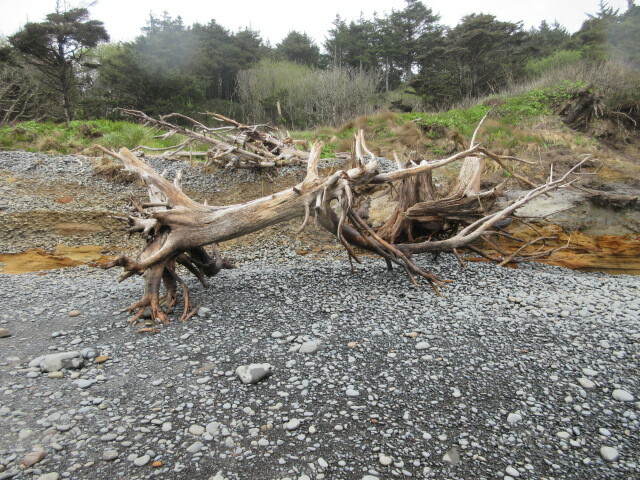 Winds were 25-35 mph. 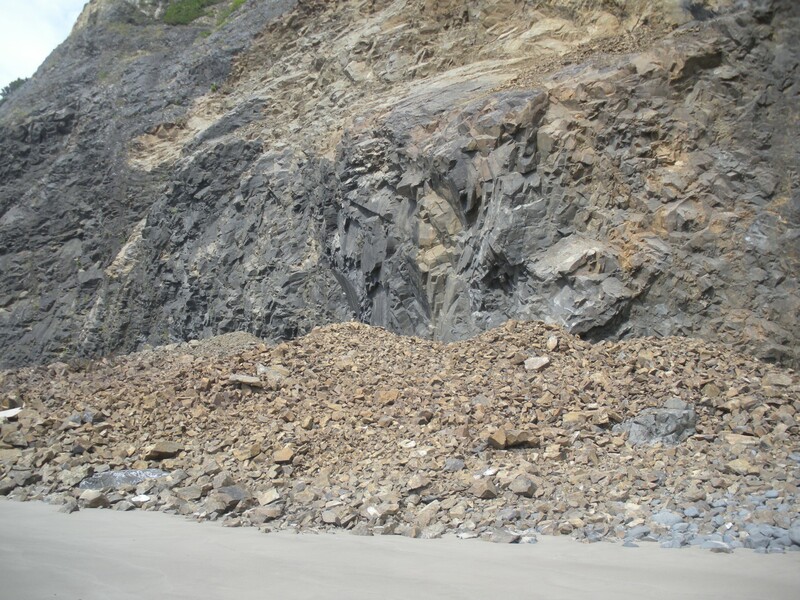 There was nothing unusual to report.In December there was a rock slide about 200 yards south of Arch Cape, see picture. 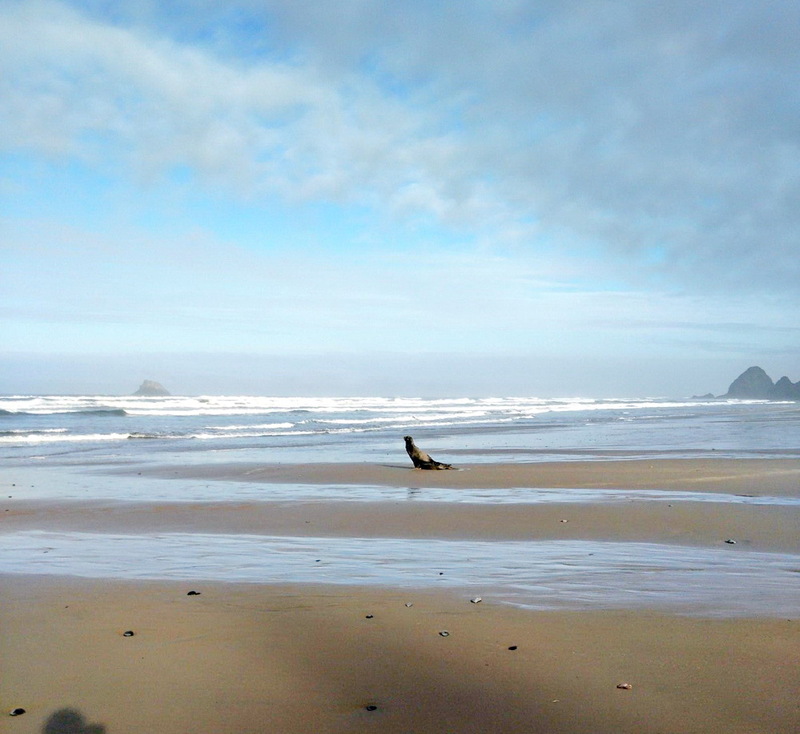 Much sand, clean beach.A seal or sea-lion in the surf. 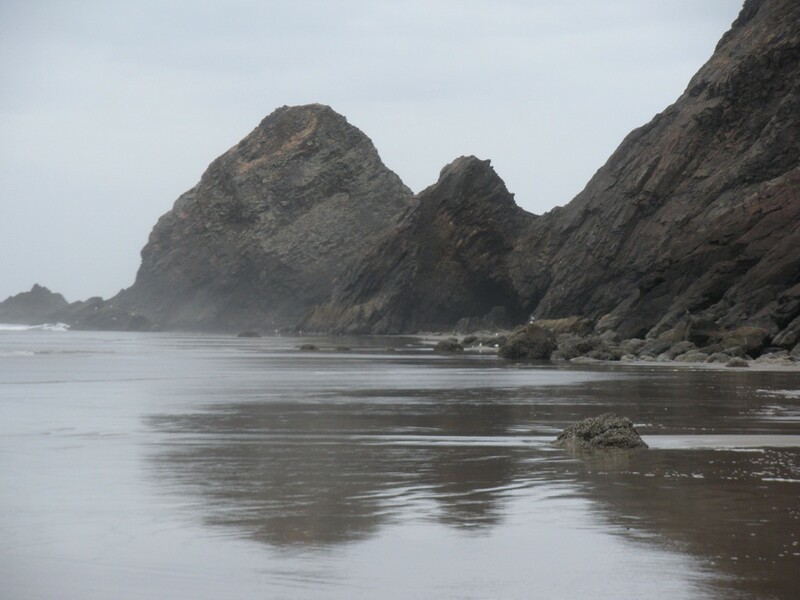 off the Gull Rocks.A few families walking with kids and dogs.No new noticeable erosion of the bluffs.very calm ocean. 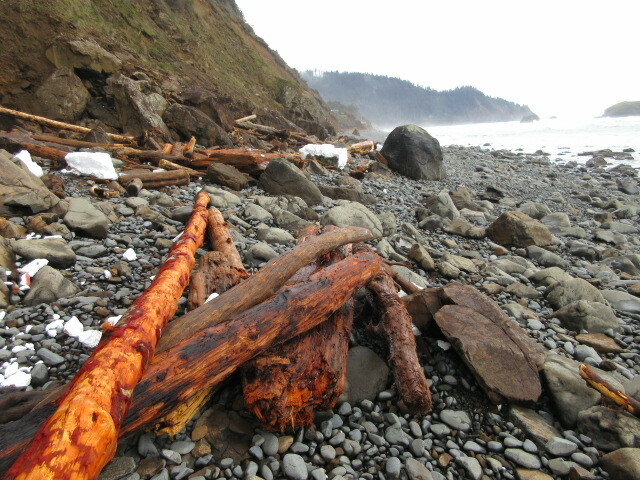 Clean beach, much new sand.Large deposits of crab casings amid bundles of tangled seaweed and fine (shrimp?) 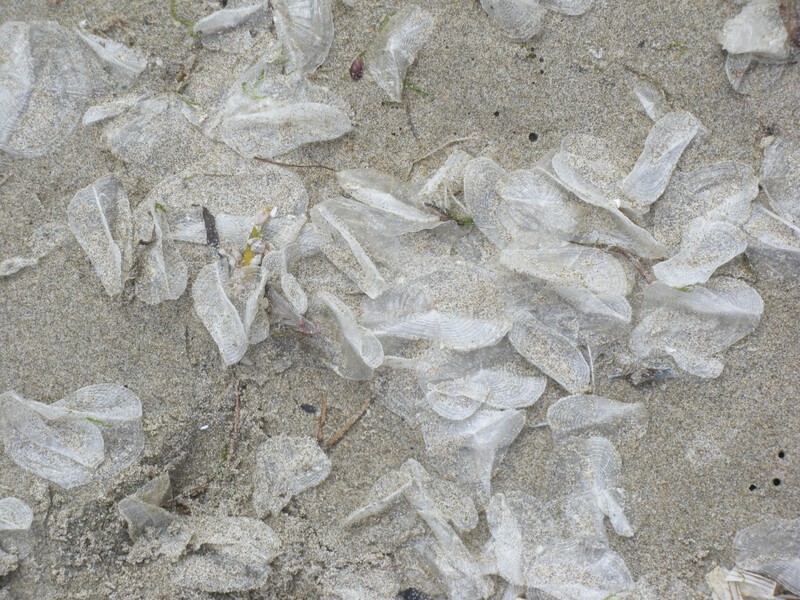 casings along the drift line. 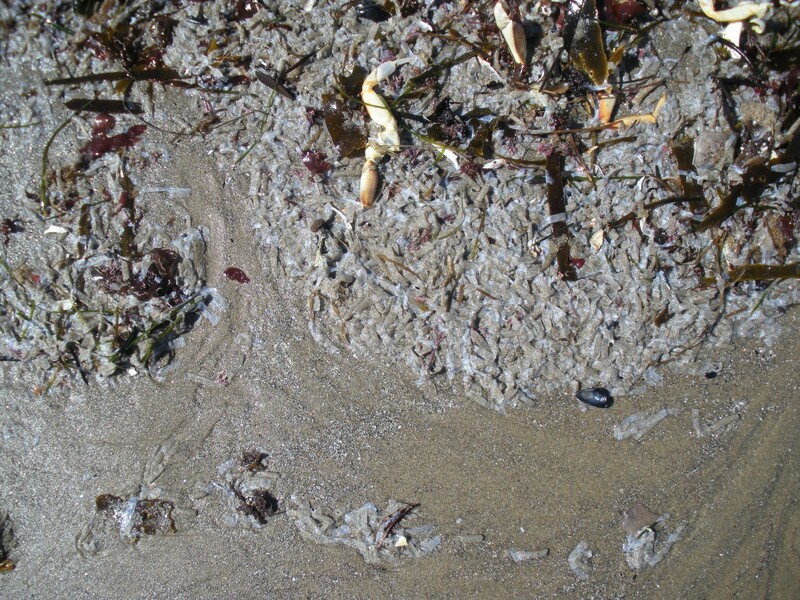 much more sand since last report, both in Cove Beach as well as North of the Arch Cape.Clean beach, some more erosion below previous erosion sites, exposing unusual root systems. 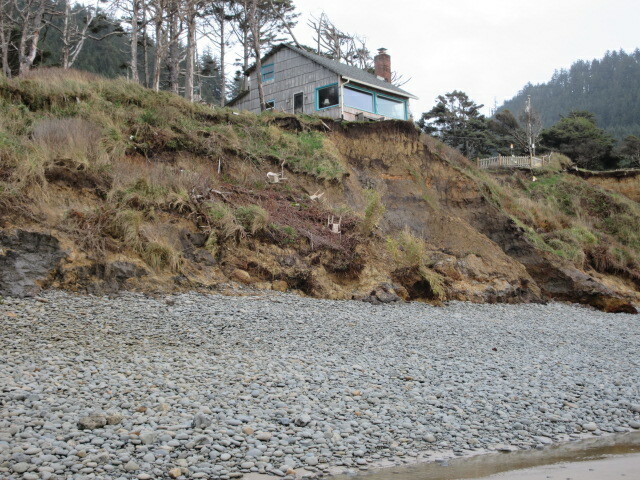 Noticed considerably more cliff erosion below the residences from 31841 to 31849 Clatsop lane.Several young bald eagles cavorting in the sky. 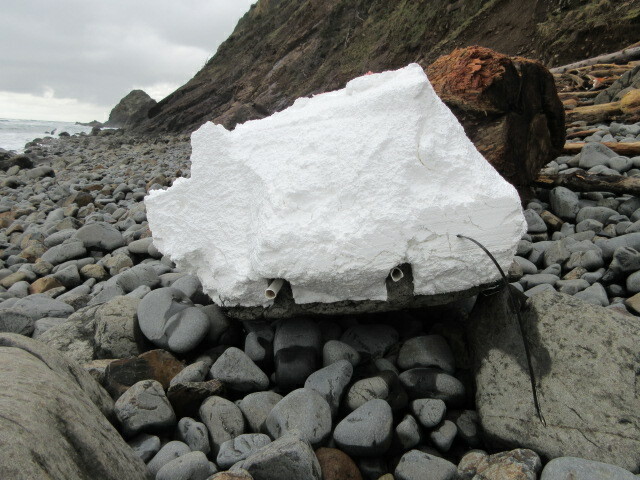 There was a lot of styrofoam and plastic bottles on the rocks. 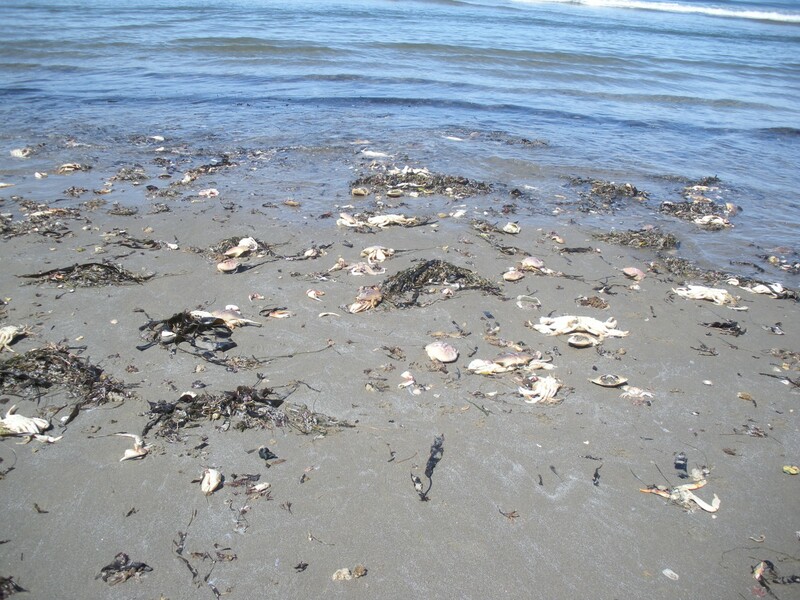 The beach was in good condition. It was a nice day on mile 307. 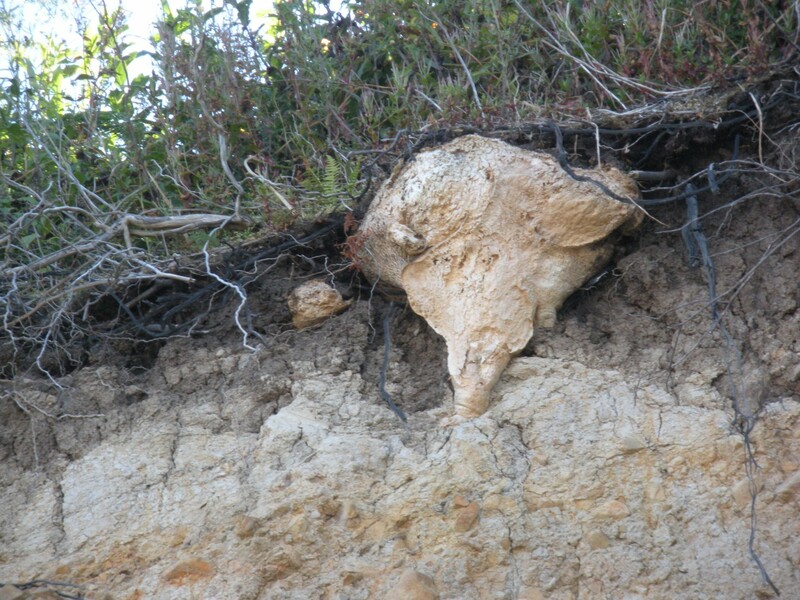 Two large (16" and 10") underground masses, exposed in eroded bluff. 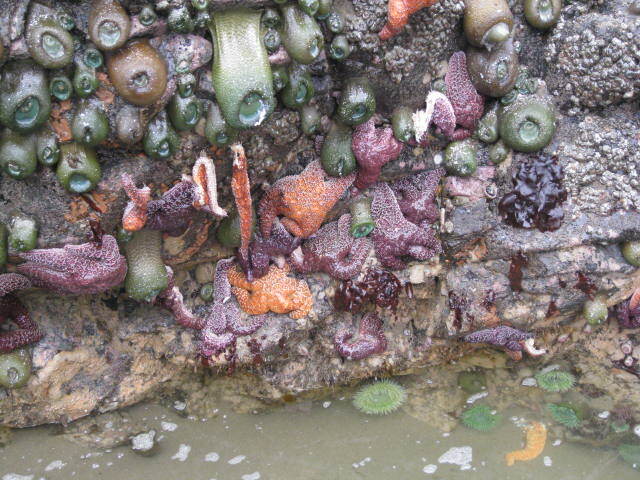 Cream colored, one funnel shaped, one oval ball shaped, @ 3" below ground, no visible plant growth out of them. 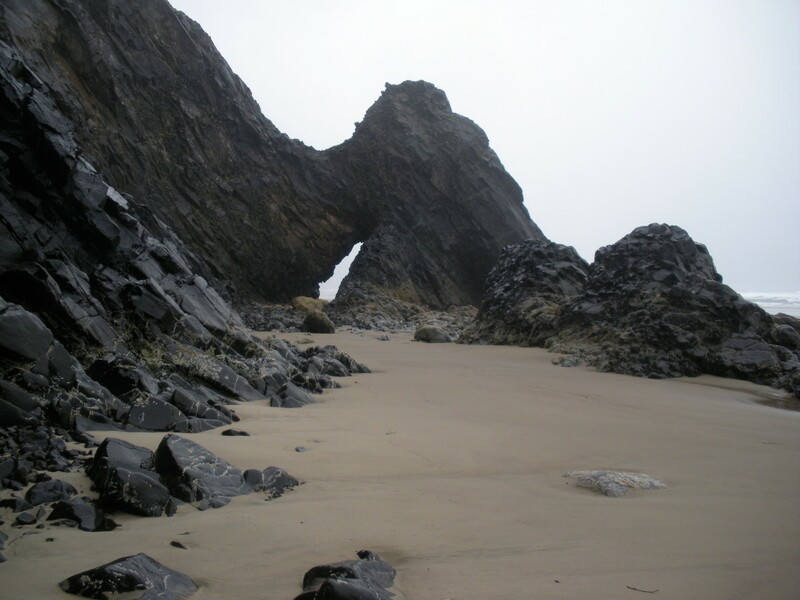 Still a lot of sand all along this mile, at a -0.5 tide, "reef' exposed.People clambering over rocks through the Arch Cape Arch.Increasing erosion of the bluff below 31845 and 31841 Clatsop Lane. Today was very windy (20-25 mph) with about an inch of rain. 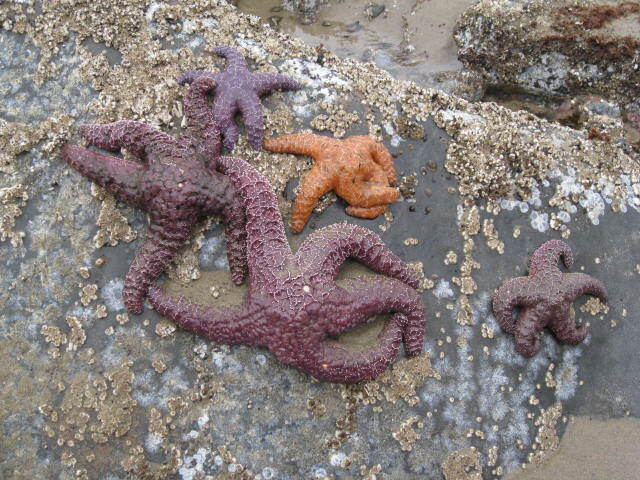 There was no sand at low tide. 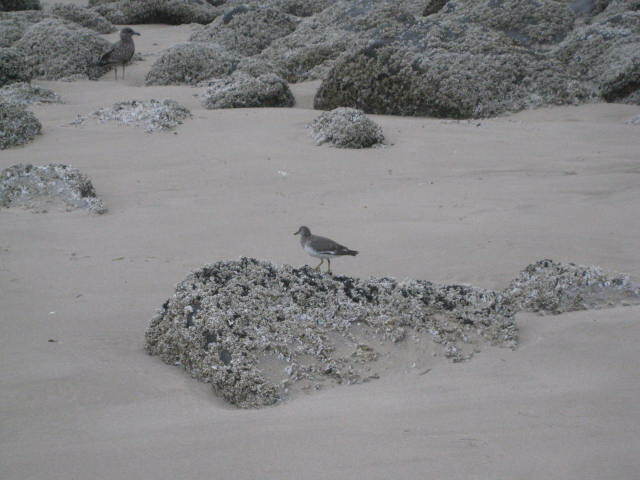 There were about 20 seagulls on the rocks. 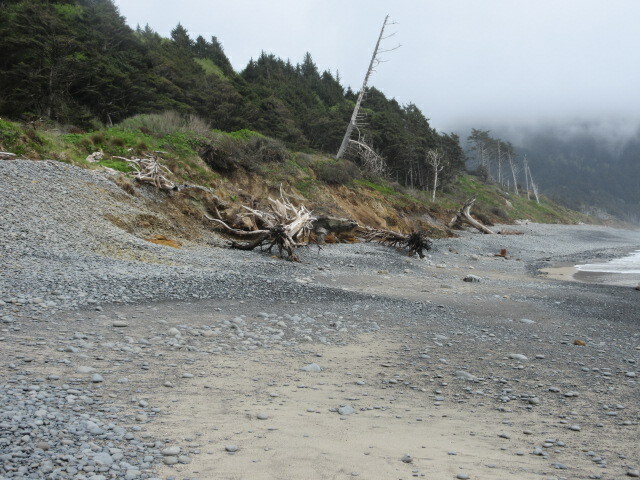 The shoreline looked normal. 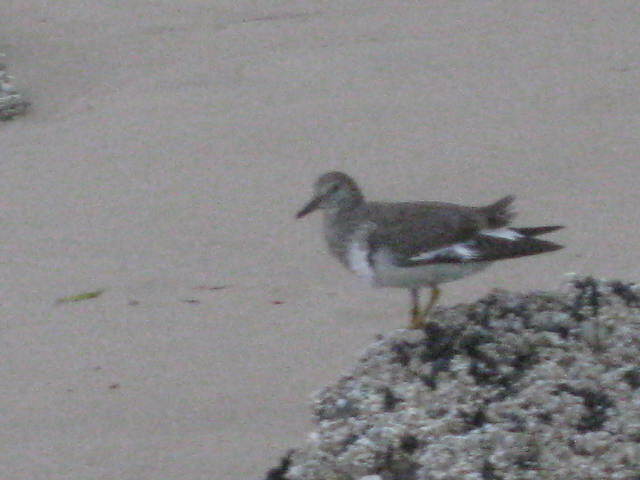 There were between 1,000 and 1,500 sea gulls on or near the beach. 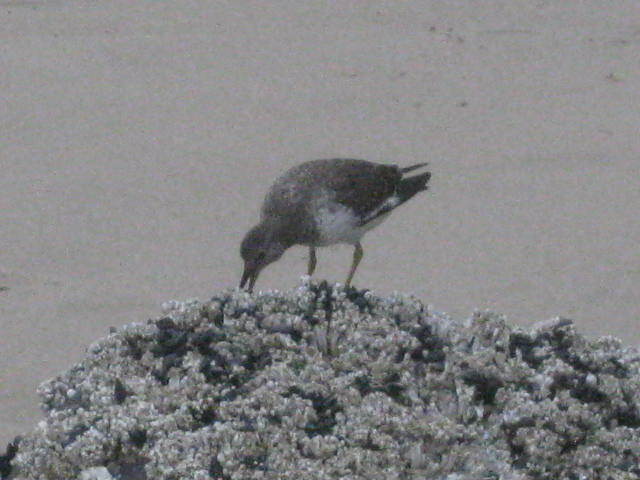 Some of the gulls were feeding on something in the water 50 to 150 feet from the shoreline. 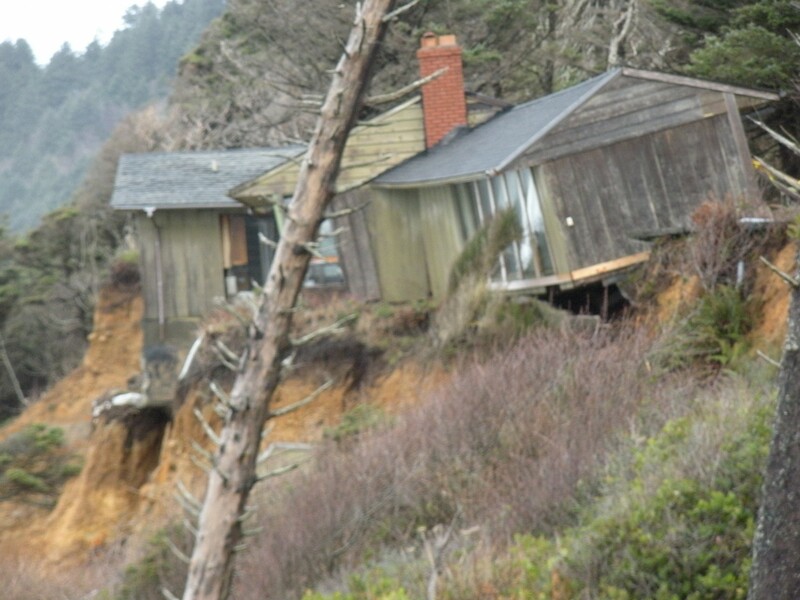 This is not my mile (I cover mile #307).But it is a serious situation where a house is ready to fall down the bluff in a matter of days, weeks at the most. #306 mile watcher might take note of this. 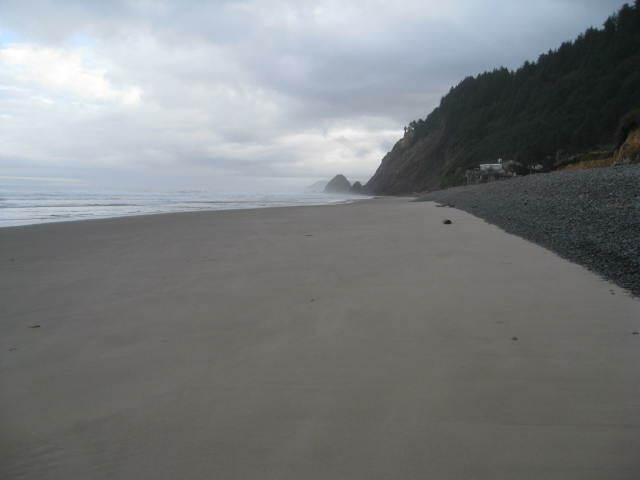 There is more sand South of the Arch Cape. 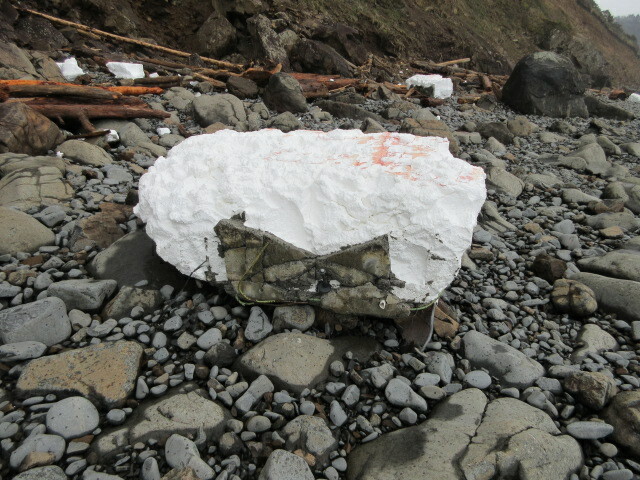 (not North).The bluff erosion areas are below 31845 and 31841 Clatsop Lane.Several large jelly fish (11-12" diam) beached North of the Arch Cape. There is nothing unusual to report about mile 307. 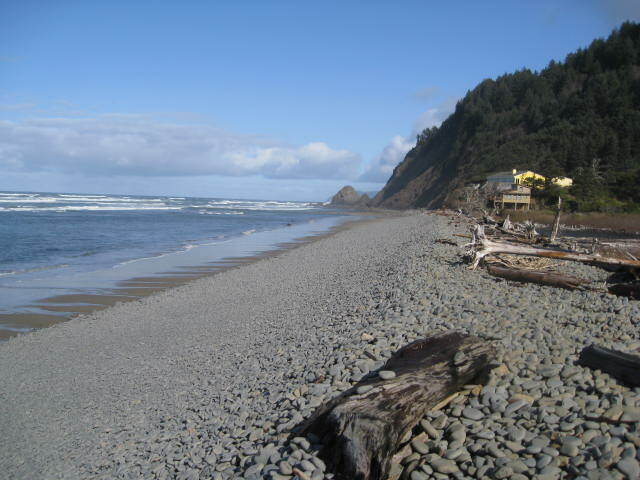 I saw one bald eagle and 10 pelicans on 12-31-08. 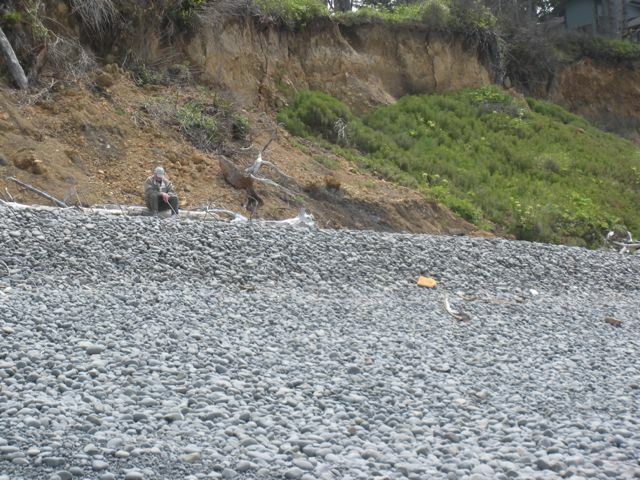 Many brown pelicans, and continued erosion of bluffs. 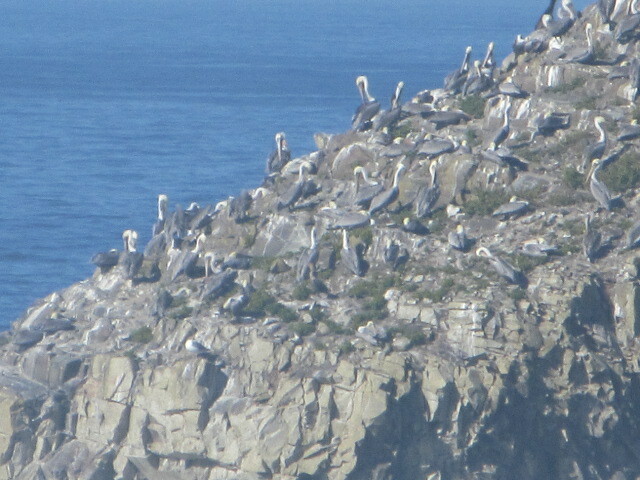 The high number of pelicans observed is normal for August. 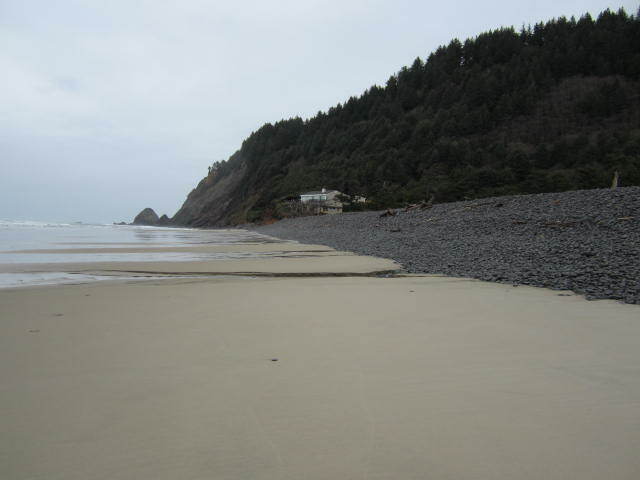 The low sand level on the North end of mile 307 is not normal. I continue to see one or two bald eagles in the area on a frequent basis. 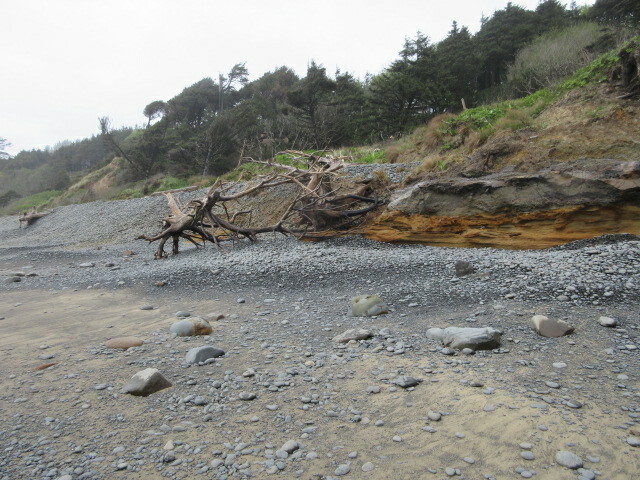 Sand level very low compared to last year this time. 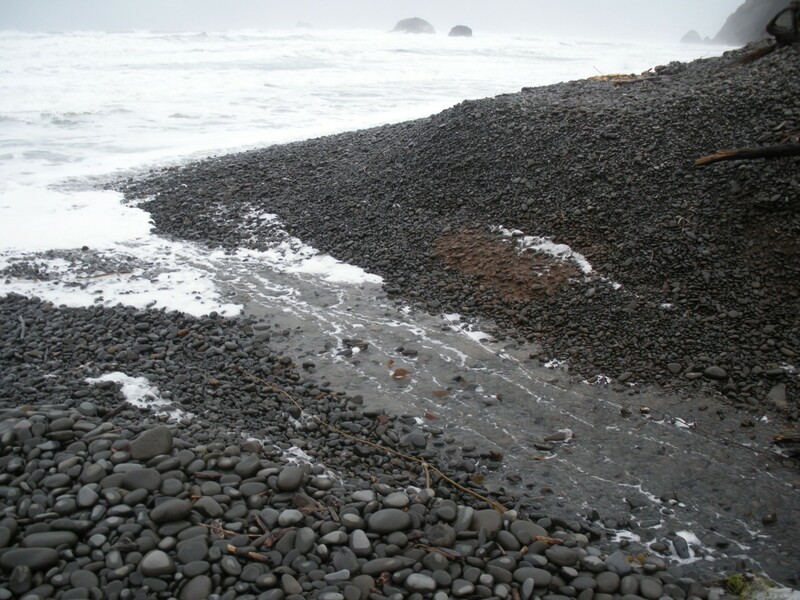 Clean beach when sand is exposed at minus tides. 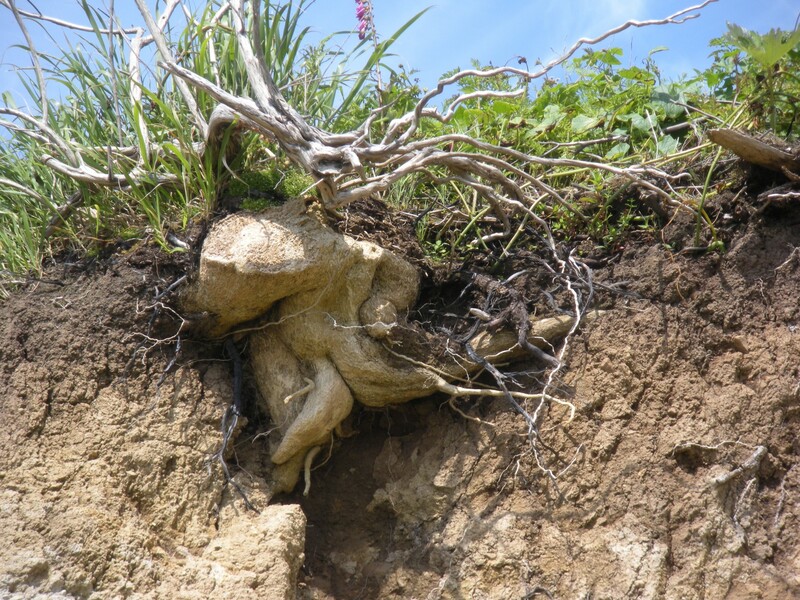 More bluff erosion, exposing ancient tree trunks and roots. 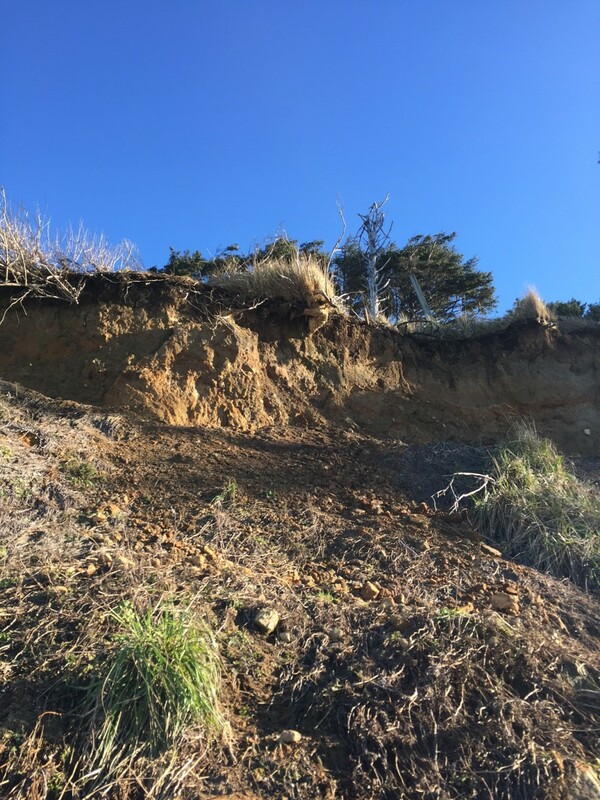 Ocean erosion continues on high banks near access point, and Bald Eagles continue to be observed. 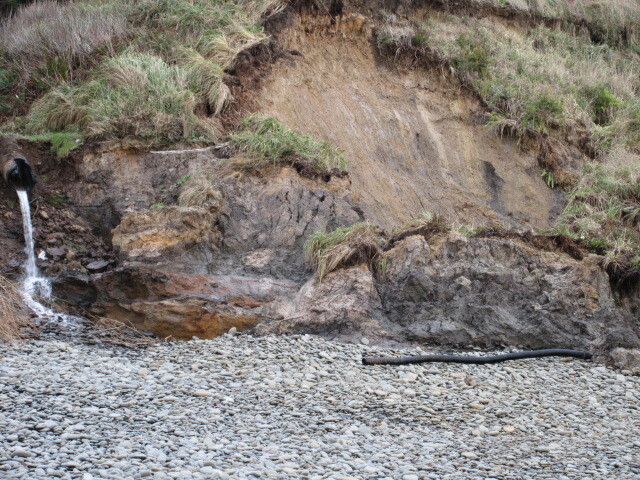 Continued serious erosion of hill side in several places and considerable sand loss. 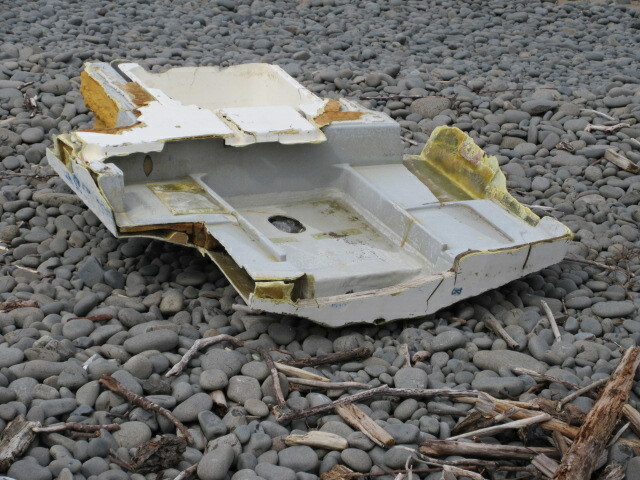 Clean beach. 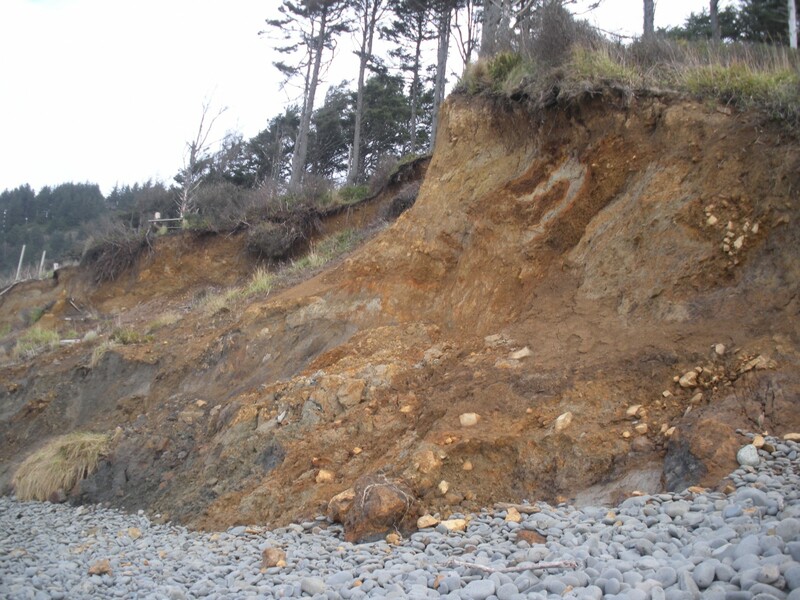 The erosion/movement of the small rocks on the shore line was more severe than normal. 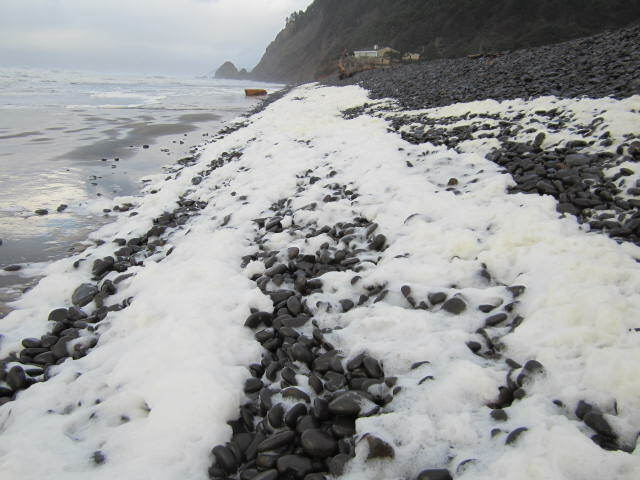 This action was caused by the large swells, large waves and high tides. Looks very good today, with no activity. 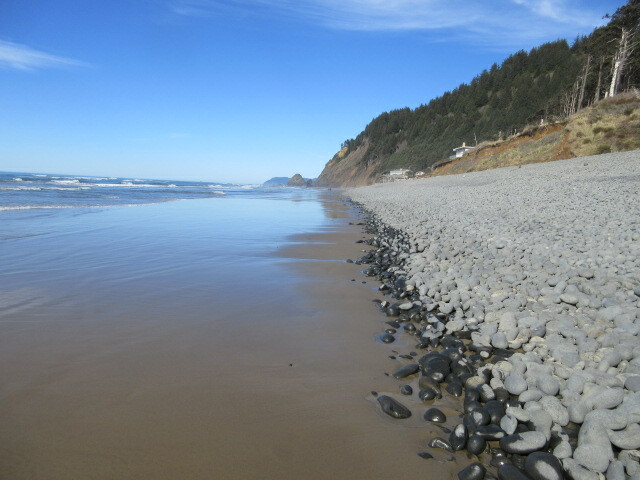 The sand level is a little lower than last year at this time and the rocks in the rock berm continue to be moved around by the ocean. One bald eagle landed in a spruce tree high on the hillside. Nothing unusual. Some sand coming back in. One bald eagle flying north to Arch Cape.